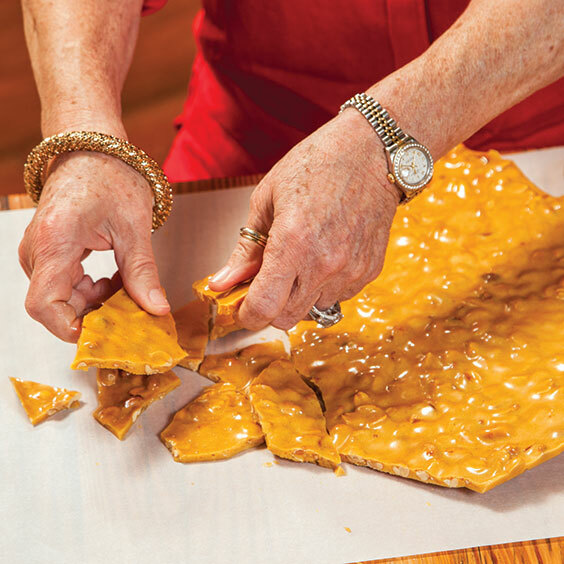 Candy tastes even better when it’s homemade, and it’s easier to do than you think. All you need to make peanut brittle is a candy thermometer and bit of patience. Generously spray a large rimmed baking sheet with nonstick cooking spray. 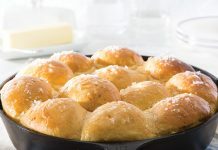 In a large saucepan, bring sugar and next 3 ingredients to a boil over medium-high heat, stirring just until sugar dissolves. Reduce heat to medium, and continue cooking. 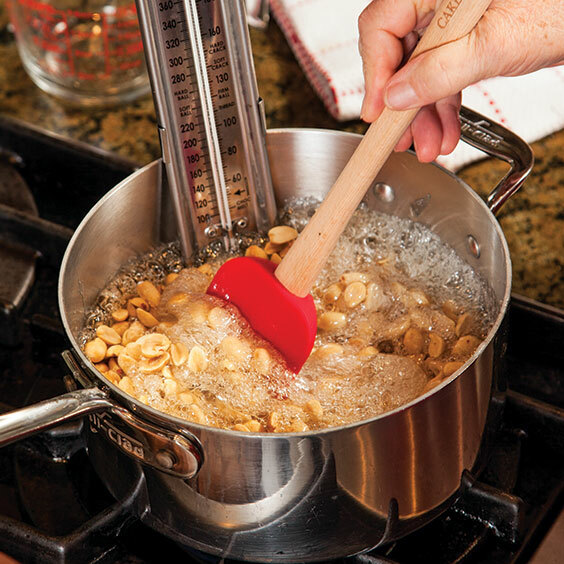 When mixture reaches 250° on a candy thermometer, stir in peanuts. Cook, stirring occasionally, until mixture reaches 300°. 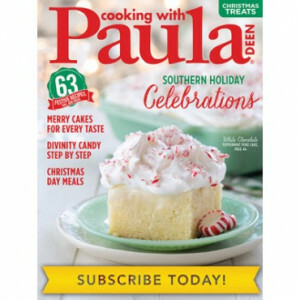 Immediately remove from heat, and stir in butter, baking soda, and vanilla. 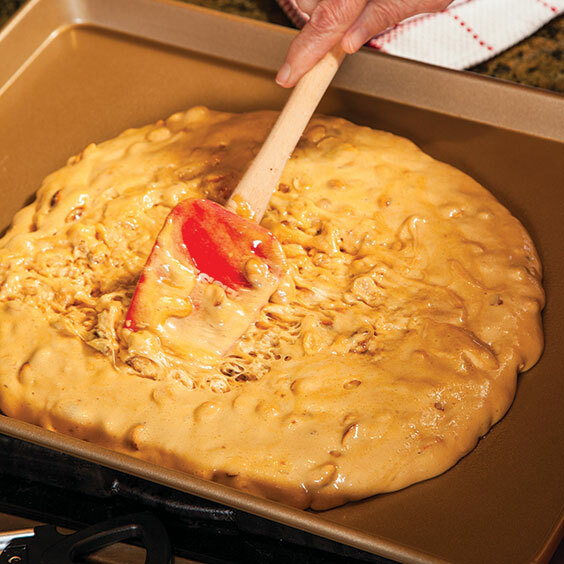 Pour onto prepared pan, and spread to an even thickness. Let cool completely before breaking into pieces. Store in airtight containers for up to 1 week. Use an equal amount of another nut instead of peanuts, if desired. STEP 1: Have your ingredients and equipment assembled and ready to go. 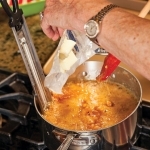 Test your candy thermometer for accuracy by placing it in a water-filled saucepan and bringing it to a boil. Once water is at a rolling boil, the thermometer should read 212°. STEP 2: Bring sugar, corn syrup, water, and salt to a boil over medium-high heat, then reduce heat to medium and continue cooking. When mixture reaches 250°, stir in nuts. Continue cooking, stirring occasionally so candy doesn’t scorch on the bottom of the pan. STEP 3: As soon as the temperature reaches 300°, remove the pan from heat, and stir in remaining ingredients. STEP 4: Working quickly, spread mixture onto prepared pan. Let it cool completely before breaking into pieces.